Brick Town Talk: LEGO Building # Awesome - LEGO Town, Architecture, Building Tips, Inspiration Ideas, and more! Thanks for blogging my MOC and the kind words. 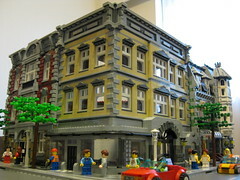 Pic of the new CC-style set, 'Grand Emporium' on the Eurobricks frontpage now! Looks like the Grand Emporium has green windows, nice. Thanks for your comments. We won't be showing pictures until they are offically released.